"Party Disco Wedding DJ Birthday Music "
Quality entertainment quality minded people. Playing the classic party songs and the music from the 60s 70s 80s 90s 00s and your up-to-date chart songs. I'm here to help you celebrate your birthday, engagements, weddings and anniversaries. Required by many venues, Nite Vision Disco has a current PLI policy with Mobile DJ Network in the amount of £10 million. Also required by many venues, Nite Vision Disco has not provided satisfactory evidence of having current PAT records available. A Method Statement, outlining Nite Vision Disco&apos;s Health & Safety procedure for setting up disco equipment has not been supplied. Why do people choose to book Nite Vision Disco? He was the right price and attended the venue promptly to see how it would work for him. 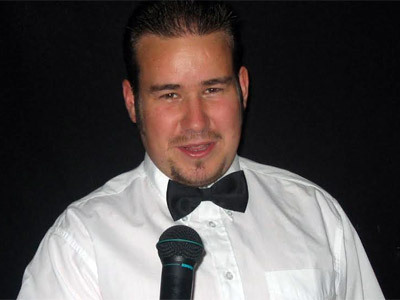 Local DJ, cheapest quote & has worked at venue before. "Would highly recommend this Guy. Read the audience perfectly and provided music to suit every individual. Not only is this Guy professional he is a great person. Friendly helpful actually awesome. He made my Husbands 50th a night we will all remember. The Manager and Staff at the Holiday Inn Swindon also commented on how good David is and asked him for his business card. " "David knew the venue, he set up quickly without any fuss and most people were on the dance floor during the evening- what more could you ask for! " 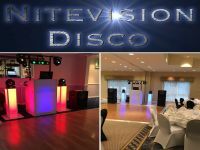 Get FREE no-obligation disco quotes from Nite Vision Disco and other DJs covering your venue. Take 2 minutes to fill in some basic details and we'll do the rest! If you are contacting Nite Vision Disco about an event, it's always a good idea to include the DATE, LOCATION, EVENT TYPE, AGE GROUP and TIMINGS to speed things up!